Love Meter Calculator is an app, which allows you to find out the love compatibility between people or to even find out whether true love exists. This love meter will provide you information on the compatibility between you and your partner or people you know. It's a quick and simple love test, which will entertain you for hours. 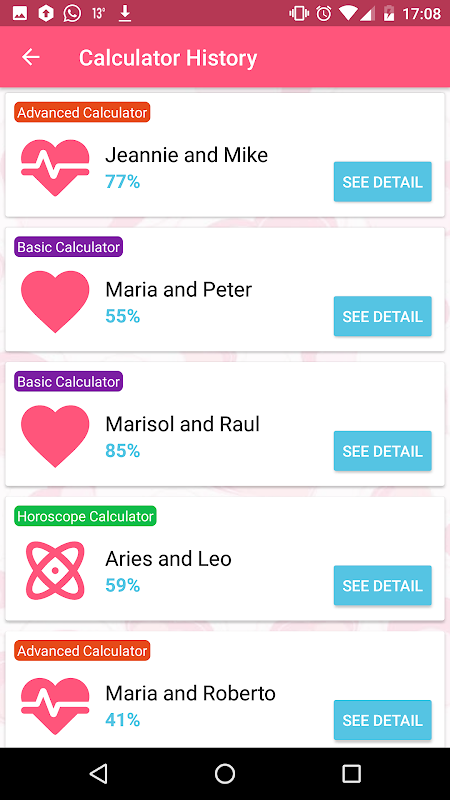 How to use the app Love Meter Calculator: It's really easy to use this true love calculator app, since we have developed all screens of this love detector to be intuitive and easy to use. 1.- First of all, you will have to choose the kind of love test calculator you would like to use. There are various options, such as the name compatibility test, the love compatibility test depending on birth dates (astrological, based on the love tarot and love horoscope), the advanced relationship test (you can add a lot of details like hair color, height, weight, age), etc. 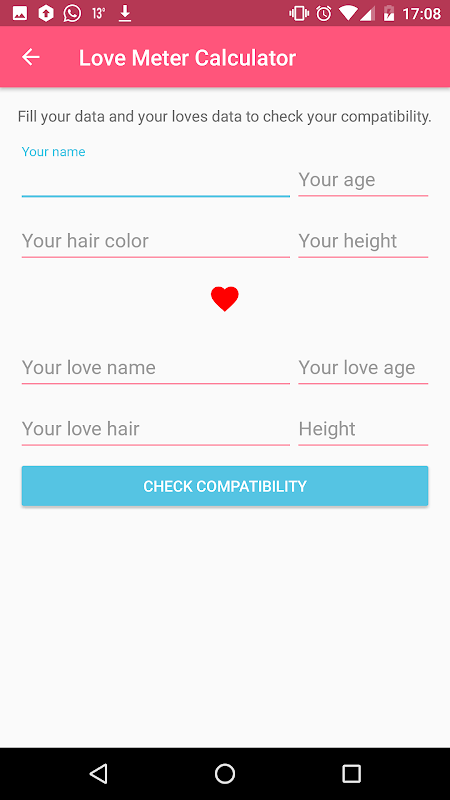 2.- Once you have chosen the love compatibility test and entered the names, you only have to add the 2 names you like and tap the button “Calculate” to find out the love name compatibility. 3.- However, if you prefer to try the astrological real love calculator, based on the love tarot, you only have to enter the birth dates to find out the love percentage. 4.- Last but not least, we provide you an advanced true love test for couples. You only have to fill in a simple love questionnaire specifying some details such as hair color, height, age, weight, etc, which will help to calculate the compatibility. Additionally, you can have a look at the history of all the real love tests you have done, whenever you would like to check all your compatibility tests and love matches. 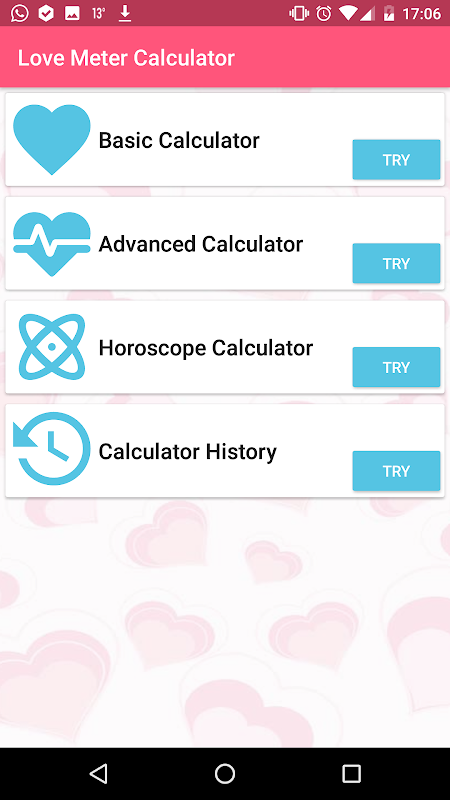 Main characteristics of the app “Love Meter Calculator Game" ★ Different types of love scanners, love quotes, love language tests or love tester games, so you can choose the one you like most. ★ Simple love questions without complications, so you don't waste time. ★ Share your love quiz results quickly and easily via messaging apps, email, SMS, social networks, etc. We hope that you like this love test app. If you liked it, we would appreciate if you could give this app a positive review. This will help us to keep maintaining the app and add new improvements and features. Note: This app should solely be used for the purpose of diversion and entertainment. Keep in mind that it’s only a funny app, consequently you shouldn't take it seriously.  Is Love Meter Calculator yours? Claim it!